There are many approaches to living life. One approach is to clarify the core principles you want to follow. These principles can become your centre. They can provide the inner compass that you can keep returning to in your daily life. 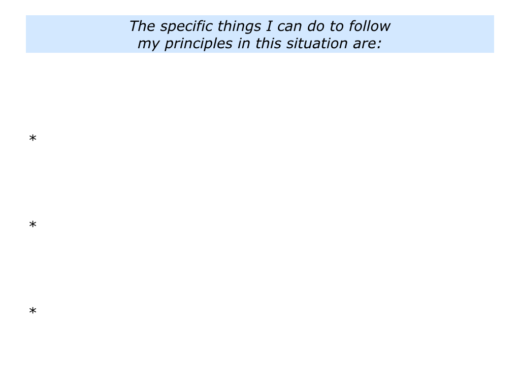 “What are the principles I want to follow in my life? How can I express in these principles in different situations? A person who takes this approach is more likely to be centred. They keep returning to their inner compass. They then focus on how they can follow their chosen principles in the different situations they encounter in life. The Dalai Llama says, for example: “My religion is kindness.” He therefore tries to express kindness in his daily life when communicating with people, giving television interviews and doing other activities. Mary Robinson, the former President of Ireland, highlights one of her principles in the title of her book Everybody Matters. Whether the person is poor or a President, she aims to be warm and make the person feel the centre of her world. She aims to show the person they matter, to show respect and to listen to their story. When appropriate, she does what she can to help them to achieve their potential. Here is a video of her talking about her memoir Everybody Matters. Different people focus on different principles. Individuals may, for example, say they believe in the following things. To be a positive encourager. To help people to build on their positive spirit and achieve their picture of success. To help to build a positive planet. I try to follow these principles when meeting people, mentoring, running super team workshops and writing. The aim is to provide practical tools that people can use to achieve their picture of success. 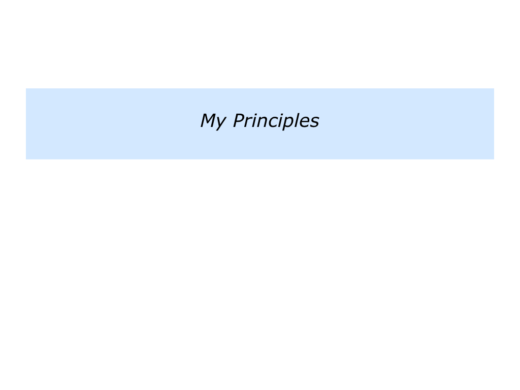 You will, of course, have your own set of principles. If you wish try tackling the exercise on this theme. This invites you to do the following things. Describe the specific principles you want to follow in your life. 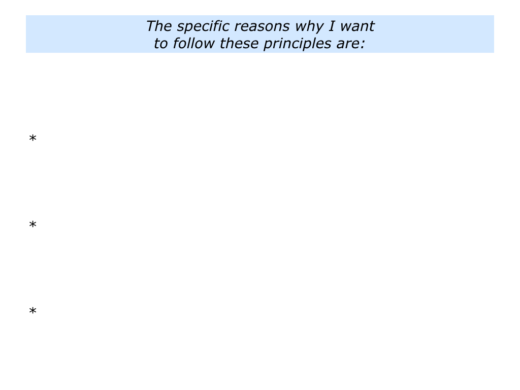 Describe the specific reasons why you want to follow these principles. You may not find the right wording straight away, but have a go. Here is the exercise. Imagine that you have clarified your core principles. Looking ahead, can you think of personal situation in which you may want to follow these? You may aim to do so when being with a friend, a loved one or another person. Imagine that your principles are to be kind, to listen to people and to help them to achieve their goals. How can you translate these ideas into practise? During one mentoring session, for example, a person I worked with said he wanted to spend more quality time encouraging his son. 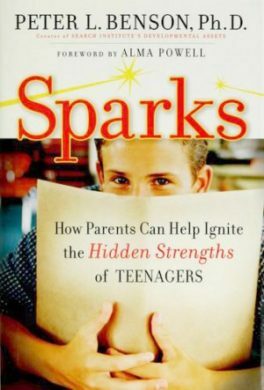 He went on to read Peter Benson’s book Sparks: How parents can help ignite the hidden strengths of teenagers. Children want to be known for their sparks. A spark is something that gives your life meaning and purpose. It’s an interest, a passion, or a gift. When you see these sparks in them, then affirm them. You shall know them by their sparks. Sparks are the hidden flames in kids that excite them and tap into their true passions. Sparks come from the gut. They motivate and inspire. They’re authentic passions, talents, assets, skills, and dreams. Sparks can be musical, athletic, intellectual, academic, or relational; from playing the violin to working with kids or senior citizens. Sparks get kids going on a positive path, away from the conflicts and negative issues – violence, promiscuity, drugs, and alcohol – that give teens a bad name and attract so much negative energy. Sparks can ignite a lifelong vocation or career, or balance other activities to create an emotionally satisfying, enriched life. Great educators look for these signs in students. They then encourage, educate and enable people to keep these alive throughout their lives. Peter died at the age of 65 in 2011, but his work lives on through colleagues at the Search Institute. You can discover more at the official web site. The father I worked with decided to spend more time focusing on what his son was good at, rather than haranguing him about what he was bad at. This resulted in the boy eventually beginning to seek out his father, rather than retreat into his own world. If you wish, try tackling the exercise on this theme. This invites you to do the following things. 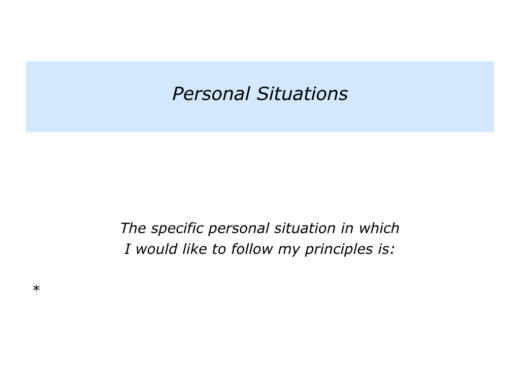 Describe a specific personal situation in which you would like to follow your principles. 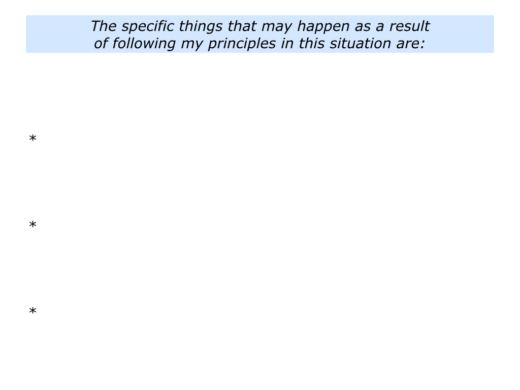 Describe the specific things you can do to follow your principles in this situation. Describe the specific things that may happen as a result of taking these steps. 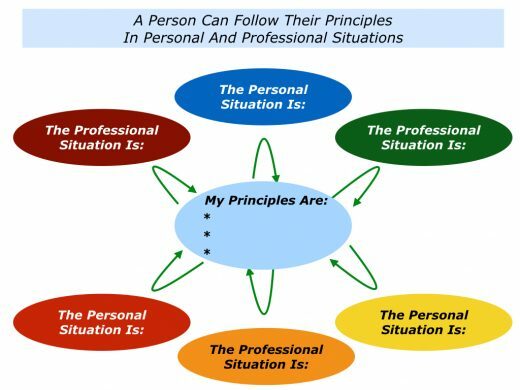 Looking ahead, can you think of professional situation in which you may want to follow your principles? You may aim to do this when helping a colleague, working with a customer, leading a team, building a prototype, tackling a challenge or whatever. Imagine that one of your principles is to pass on knowledge that helps people to succeed. How can you do this in the specific professional situation? Many of the people I work with want to take this step. They may act as partners, consultants or trusted advisors to customers. 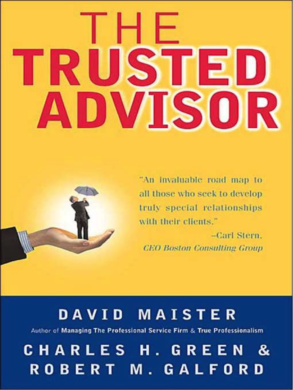 Bearing this in mind, we explore some of the themes outlined by David Maister, who co-authored The Trusted Advisor. We start by inviting individuals to clarify their own experiences. Looking back, can they recall a time when they were helped by a trusted advisor who passed on knowledge? What did that person do right then to help them to succeed? Different people highlight different things regarding how their trusted advisor behaved, but here are some of the common themes. They made me feel the centre of their world. They listened to my story, clarified my goals and played back what they believed were the aims. They then asked if it was okay for them to share their ideas. They began by outlining the things we could do – the specific things we could control – in the situation. They shared the possible options for going forward, together with the pluses and minuses of each option. They also, when appropriate, shared their knowledge and recommendations. They underlined, however, that it was ultimately my decision and gave me time to reflect. They then, once I had made my decision, again explained the implications. They explained what I could expect to happen at each stage of the process going forwards. They explained the various roles – their role, my role and the roles of other people – as we worked towards the aims. They then acted to pursue the chosen way forward. They used their skills, knowledge and wisdom to do what they could to help me to reach my goals. Bearing in mind their own experiences, individuals look at how they can follow the principles they believe in. They then take practical steps to help other people to succeed. Imagine that you have your own set of principles. You can aim to follow these in the professional situation. It will then be time to take the next step, which is to return to your centre. Different people do this in different ways. You may choose to take time to reflect, do deep breathing, get a sense of perspective or whatever. After refocusing on what you believe in, it will then be time to go out and follow your beliefs in the next situation. Some people follow this process throughout the day. They manage to retain a sense of stability, even during turbulent times. This is because they refocus on their inner compass. Such people reacquaint themselves with their deepest beliefs. Looking ahead, they rehearse what they are going to do next. They then translate their beliefs into action and work to deliver the desired results. Let’s return to the professional situation in which you may want to express your principles. If you wish, try tackling the exercise on this theme. This invites you to do the following things. 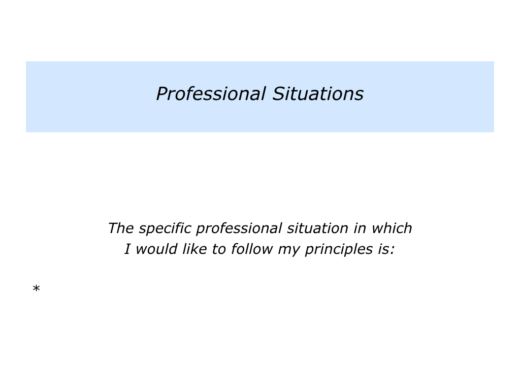 Describe a specific professional situation in which you would like to follow your principles. Site by Mike Pegg, 2019.